This Raspberry, Limoncello and Prosecco Cooler is a simple and lovely cocktail featuring Limoncello, frozen raspberries, and Italian sparkling wine. I can’t drink anything with Limoncello without thinking of Boston. After my daughter Emily graduated from college her first job as a teacher was at a private school in the small town of Milford, CT. The summer after her first year of teaching, I traveled from Denver to New York City where I met my sister Lauren who had come in from Wisconsin and from there and we drove to Milford. I’ve heard more than one person lament their own experience in Boston and it usually includes having to deal with rude and impatient people. We were truly blessed; our entire trip was filled with the most fun people imaginable. We stayed at a charming Bed and Breakfast in the North End that turned out to be the perfect choice. Continental breakfasts were perfect for our busy schedule and the locale was amazing. I’ve not been to Italy but this felt close; the language, the humor and the amazing generosity of spirit we experienced. 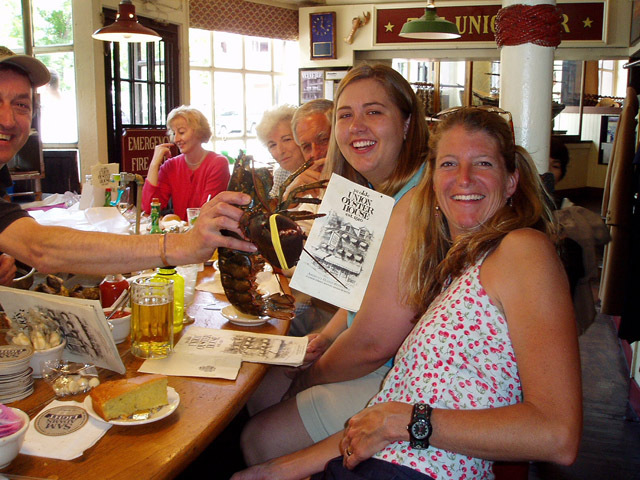 Everyone was so friendly and fun, even the pet lobster from the Union Oyster House (featured with my daughter and sis above) . Sure we made it up to Harvard, bought the requisite sweatshirts and at least made of point of driving by Cheers (loved that show). Still I could not wait to get back ‘home’ to our B&B and just visit with the local shopkeepers. On one excursion we ate the best damn Eggplant Marinara sandwich imaginable at a small local deli. That evening we were treated by the owner of my favorite restaurant to Limoncello after dinner. Great dinner, windows open to the street, twinkle lights sparkling everywhere and Limoncello? It was almost magical. Wait, strike that…it WAS magical! Though I had never had Limoncello before I can promise you this…I’ve never been without it since. Since Emily is now in North Carolina and Lauren just moved to Vegas I might be making a pitcher of these for Mother’s Day. Just for me. They are a light and lovely cocktail that make the transition from brunch to an afternoon apertif without a problem. Originally inspired by a recipe from Giada De Laurentiis; I’m certain this makes a great light ‘cooler’ but I did not have sparkling water on hand. Luckily I did have sparkling wine (no big surprise right?). I am a huge fan of both Cava (sparkling wine from Spain) and Prosecco (the same from Italy) and love it mixed with other liqueurs. Doesn’t Limoncello and Prosecco seem like the perfect Italian cocktail? With the addition of raspberries instead of blueberries, the result is even prettier and I can see it gracing many a table during the summer and for special events all year long. Want to take it beyond the apertif? A bit of vodka is a nice addition and of course I tested it to make sure…just for you! Salut! Make this for your Mom or yourself…I promise it’s perfect! Add limoncello, stir and then finish with the sparkling wine or water. The proportions for this cocktail use less Limoncello than Giada did. You might want to have a higher proportion of Limoncello but I thought this was perfect. So glad you enjoyed them Abby; they are a perennial favorite here and I hope to enjoy one soon…as soon as my mint starts showing itself from under the snow! I’m a reporter with NBC Owned TV Stations. Could i use your photo of the limoncello cooler in our Mother’s Day roundup? 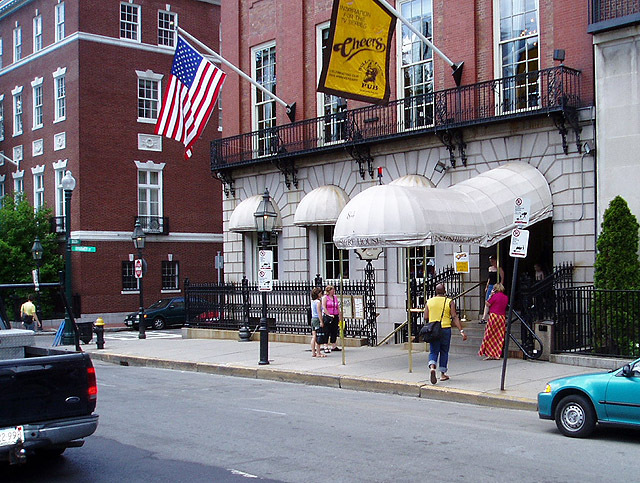 i live just outside of boston and love the north end.what is the name of the b and b you stayed at? Beautiful accommodations and we loved the Continental breakfast and were fine that it wasn’t the type of B&B that included meals…we wanted to eat out! I’m jealous; though most of yesterday’s snow has melted it’s still cold here and I’m more inclined right now towards hot chocolate with tequila! 77 sounds terrific right about now and yes, this would be perfect Pat! How gorgeous! This is definitely one for the summer months! Guess you’ll have to save it for then; it’s worth it Lizzy. Thanks Alison…I love that they are so versatile; raspberries, blueberries…make it a berry and it will work! I have fond memories of Boston too when I worked there one summer during college. Great city. I think of your homemade limoncello each time I see it in a bottle in the store and keep meaning to make it myself. I’ll get around to it. Beautiful photos, Barb! Boston is a great city! Loads of wonderful food, and so much to see and do. Limoncello is pretty wonderful too — and nothing screams warm weather like Limoncello to me. Great drink — thanks. So right John…I love it just plain ice cold; there is truly ALWAYS a bottle in the freezer! Thank you! wow. what a great way to lighten up limoncello! great idea! and i’ve never come across anyone rude in boston either!!! Because the Prosecco has bubbles I would not recommend it; I would worry it would go flat. I would have everything else ready and then have guests top off their cocktails with the Prosecco. My mouth watered just looking at the pic! Yum. Then mission accomplished! It is such a light and lovely cocktail…truly one of my summer favorites. I love the recipe. It’s delicious. I tried it yesterday and it taste awesome. Thanks for sharing the recipe to your readers. You are most welcome…it’s one of my favorites too. Found this on Pinterest and made these for New Years. They were great. Thanks for the recipe. So good to hear…I love them too! So fresh! I’m from the region of limo cello in Italy. I love it! How lucky are you…and yes, this was a lovely, light cocktail. Pretty too! 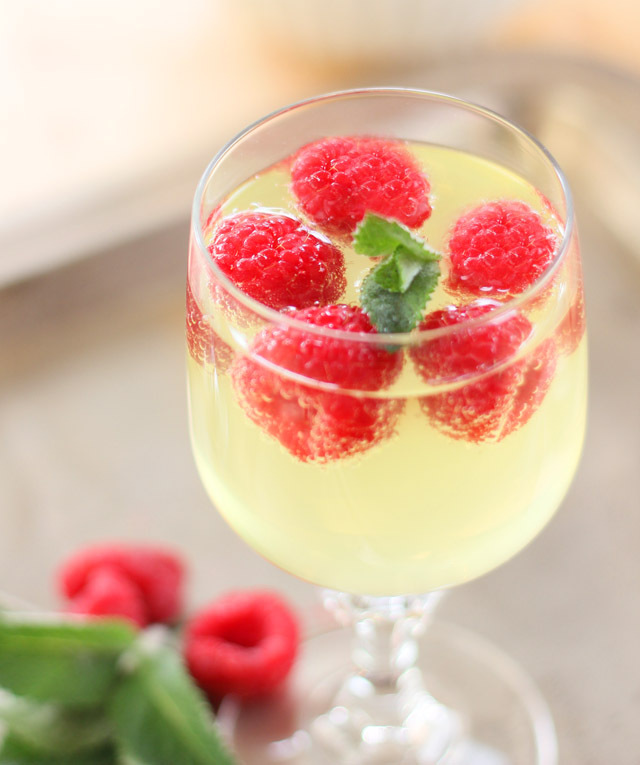 Your Limoncello recipe with raspberries sounded so good can’t wait to try it. This summer was the first time I made Limoncello and everyone went wild about it even my daughter that now wants to use it as a signature drink at her wedding in May. I have searched to see how to store it. Most sites say “it’s so good it doesn’t last long.” You mentioned your brewing facility (garage) so how long do you store it, in refrigerator, freezer? I don’t want it to go bad for her special day. It actually lasts quite a long time; the alcohol serves as a preservative. I had to move mine out of that ‘faciliy’y in the summer when it got warm but I have some sitting on my bar that I made in November that is just fine. One reader contacted me a couple of months ago…they served that raspberry limoncello cooler at her wedding…it is so beautiful yet light, refreshing and well…did I mention beautiful?!! We keep our Limoncello in the fridge ~ have had it there for awhile and it is fine. Boy oh boy, these look soooo refreshing! I must admit I’d not heard of limocello until I saw this post, but now I’m a believer! 🙂 This drink is going to be the perfect accompaniment to our Memorial Day picnic. The frozen raspberry ice cubes are just the right touch. Oh, and DH and I are taking a trip to Boston in the fall. Mind sharing the name of the B&B you stayed at? It’s been a few years (like 8) but a web search was successful. They were beautiful suites right in the heart of the North End, it was a little like going to Italy! Not the standard B&B with communal meals though which was fine with us because we wanted to eat out a lot; they do serve a Continental breakfast each morning where guests help themselves to pastries, fruits and coffee. Absolutely beautiful accommodations. This past week I did a post on how to make your own Limoncello…if you love it, that could be next! I cannot wait to make this. Limoncello and Prosecco are two of my favorites, plus I can feel “healthy” because of the fruit. 😉 This was on my list for the weekend, but time slipped away. That’s OK, though, cuz it’s going to be a LONG summer. I’ll have plenty of days when I’m sure this will be exactly what I need! Yes…that’s it; a ‘healthy’ cocktail. Well, I’ve worked hard all weekend (my yard shows it but I look dead) and I’m thinking I need this for revival, right? We love Boston! Our daughter and her husband live there and, soon, our first grandchild 🙂 Granted the weather isn’t always the best, but it’s such a fun city. Next time you must dine at their restaurant in Cambridge (Catalyst). William just won Food & Wine’s Best New Chef New England. I like Limoncello but sometimes find it a bit cloying – love your fresh take on it. I was stopped by a friend from packing and moving there with his stories of the winter. It’s a well kept secret that Denver weather is actually better…the mountains get all that snow…not us! I JUST read that issue…how exciting. My congrats to him and I would surely stop by if I get back there…hoping that will happen one day soon. Have to try this ~ It sounds so yummy! Have some Limoncello we brought back from Italy! We just loved Italy, especially Sicily ~ And the food there is just delicious! Been there twice and would like to go again to do the Northern part one day. I need to teach my kids how to make this for next mother’s day! looks delicious! Raspberry ice cubes! You are brilliant. I can’t think of Limoncello without thinking of Cinque Terre in Italy. It was the first time I had it…and I had a lot of it. I lived in Boston for two years after college. It was a tough city when the sun wasn’t out. I am convinced that spring/summer Boston is a completely different winter Boston. But the best version of Boston is in the fall. Next time you go, make it October. We are big limoncello fans around here, but I’m always looking for something more to do with it! THis looks amazing! Thanks Kristen…so easy too; I’ve mentioned to others that I tried it with the lemon sparkling water after the fact and have to say that’s a great (and really light) version too. My new favorite! I love the raspberry ice cubes idea. It’s functional yet makes an amazing garnish. I see myself doing that more this summer with other fruits too. The raspberry really doesn’t flavor the drink but it sure made it pretty! My kind of drink!!! Not sure if you notice any of my travel posts in Austria, Prague, and Italy recently, but I fell in love with the Aperol Spritz! Not sure I would have ever tried that if not for your guest post, so thanks! This looks incredibly refreshing and I bet it would go down so smooth this summer! Pinned! You are right on…I tried one the day after my post after finding lemon sparkling water. Oh my…if it weren’t booze I could easily season every glass of water with a bit of Limoncello! Everyone certainly looked like they were having fun at that restaurant! This drink looks so darn inviting and refreshing (amazing photographs) that I’d love a glass or two of it right now. Hope you are enjoying a lovely Mother’s Day weekend Barb. I do love Colorado but I would be happy to return to Boston in a heartbeat! Have some Limoncello and imagine? The North End is just my kind of place…SO very Italian. I’ve never put the two together but it seems inspired! I adore a good lemoncella and prosecco was what we served at our wedding instead of wine! I’ll be making this VERY soon!! It sounds so refreshing and it’s simply gorgeous! It is the perfect light drink; I even bought some sparkling lemon soda to try after I did the post and loved it too; even lighter! Funny, we also had a great time in Boston and found the people friendly. Went to all the places you mentioned, I tried clam chowder in the Union Oyster house. Happy memories! I happen to have both Prosecco and Limoncello and its gone 5:30 here, Im off to try!! Thanks Barb, great post! What a wonderful summer cooler =) Can’t wait to fill a pitcher up with this! The second I saw this picture on tastespotting I thought it would be perfect for Mother’s Day… and then I read your caption. Ok, confirmation, I NEED this on Mother’s Day. or today. Or both. Both, that’s fine with me! Both sounded good to me; it is so my new favorite; the ease of prep doesn’t hurt and I found a champagne keeper thingy today that is supposed to save the bubbly after it’s been opened. That would be nice; I could have one EVERY single day. YES!! This looks delish! I make watermelon ice cubes, I’m sure thy will work great with this recipe ! I make homemade limoncello and I’m getting ready to make a new batch. I can’t wait until it’s done (but I’ll have to because it takes 45 days) so that I can make this drink!! Mine is almost done; very excited to try it. I’ve made so many liqueurs but this is my first attempt at Limoncello (why? I have NO idea!). Next weekend for me…so Cheers! This cooler is simply gorgeous! I saw it on Pinterest and can’t stop thinking about it :-). And I have so many frozen raspberries – it’s perfect. Wonderful recipe! I would like to invite you to share this post (and others 🙂 ) on a new photo based recipe sharing network that launched only this Monday. The idea is simple: recipe photographs are published within minutes of submission. No rejections, no reviews. And, of course, the images link back to the author’s site. It’s called RecipeNewZ (with Z) – http://recipenewz.com. Thank you; hope you’ll try it. I would love to submit some recipes; thanks for the heads up. Not this moment but I’ve registered and I’ll put some of my favorites on there soon. Thanks! I have been meaning up pick a bottle of Limoncello forever – now, it’s officially on my shopping list. I really couldn’t imagine a more perfect cocktail and I cannot wait to hear all about your homemade version! You might even really enjoy the original recipe Jamie which used lemon sparkling water in lieu of the sparkling wine. I tried one today and it is so light and refreshing…I love them both! Love this post and your photos! I enjoyed reading about your trip to Boston – happy you had such a lovely experience. I grew up there and just got back from visiting my folks. We had the best time…we ate our way around the city. They live near the North End, so no visit is complete without a walk through those streets and a lemon ice (from a barrel outside the shop) – so much to soak in. I always need more time! And this cocktail? Oh yes! 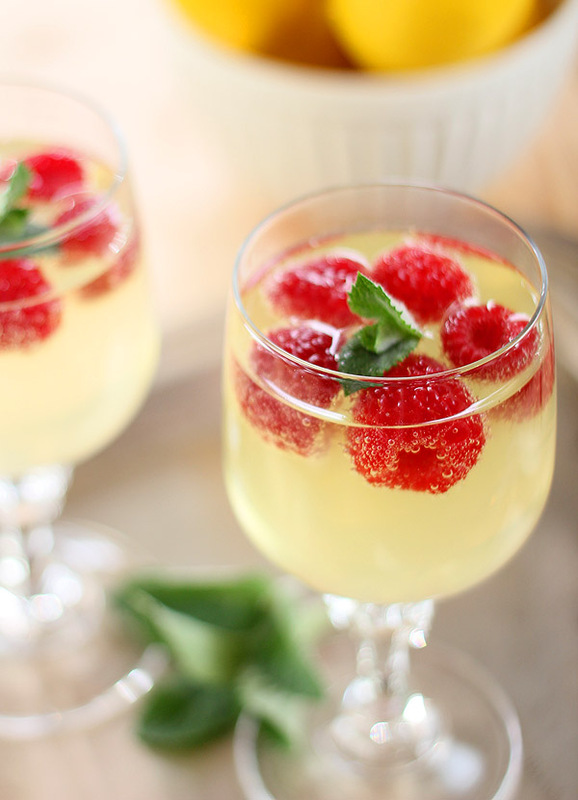 I adore limoncello with prosecco, and the addition of raspberries is a perfect pop of color and flavor. This is what I’ll be sipping on Mother’s Day. Happy Mother’s Day to you! It was so perfect. We left Boston and spent a day in NYC…such a letdown. I’m from a big city; nothing about them is all that appealing to me and I just loved the ambiance of the North End. I have to get back! This looks so refreshing. I’m curious to see how your homemade limoncello comes out! Me too! Some do it and let it steep for days but I like a longer period of time and I’m SO ready right now. Oh my! This sounds perfect! I love Limoncello and Prosecco, but never thought of blending them together – it seems so obvious! And, I love the frozen Raspberries! Perfetto! I’m not sure why I haven’t either Susan; I make cranberry liqueur over the holidays and it’s one of my favorite pairings so this should have come to mind. All I can say is better late than never! I, too, have only had positive experiences in Boston. My husband had a movie there a few years ago and we lived downtown for 5 months. It was great! This cocktail looks amazing, can’t wait to try it! I loved it there so much I was ready to move…then my business partner said, ‘Imagine those charming cobblestone streets with snow piled high and trash that can’t get picked up.’ He quite obviously did not want me to go! I love this cocktail Kelley; not the least reason because it could not be easier. I’m getting some sparkling water today and giving that a try too…talk about a ‘light’ cocktail, that would be it for sure! OMG, these photos are AMAZING! Love this combination Barb! Your story about Boston was so charming, I love Boston and I too, have never had a bad experience with the people, I am most at home there myself. Thank you my sweet friend…getting great photos is still a hit and miss for me but I know this…it’s when I actually devote some time that I’m happier with them. Duh huh? It’s finding that time that is the struggle. I know you know what I mean! Incredible, raspberry and lemon are just about my favorite, so perfect together and the raspberry ice cubes are brilliant. I know…I love that touch with the frozen berries. I’ll be doing it again with other berries; a beautiful way to add some chill and beauty to a cocktail all at the same time! Is it ok if I have one of these coolers for breakfast? That would be ok, right? You have my permission…it’s no different than having a Mimosa right (unless you opt to go the vodka route!)? I’m head over heels for Limoncello! This is the perfect way to start off the weekend, thanks for another great cocktail! Lovely memory, thanks for sharing. I can’t wait to try this drink as I have all of the components on hand. This recipe comes at the perfect time since Mother’s Day is Sunday. Mama loves to get her drink on! So easy and so good. Perfect for Mother’s Day isn’t it? Cheers! High praise indeed because you know I love your photos! Thanks a bunch for the inspiration; I love this cocktail in all ways…tastes great and is so dang pretty. Barbara, I live next to Milford, CT too! Next time your in town we need to have lunch with all the local food bloggers. So glad you had a wonderful time in Boston, I always have good time there too! The Oyster House Rocks! That would be fun…I love it up there. Although my daughter only lasted 18 months at that school and is back in Denver now I have such warm memories and hope to get back.